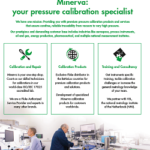 Minerva is the place to be in the EMEA region to have your Fluke instruments calibrated! 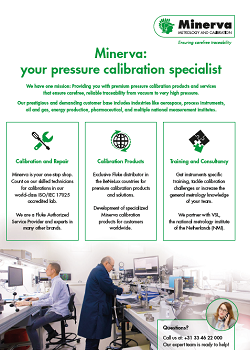 In 2007 Minerva was selected by Fluke Calibration to become Fluke Authorized Service Center for Europe, Middle East and Africa. As a Fluke Service Center, we are well equipped with the necessary instruments, standards, procedures, and personnel meeting Flukes requirements for quality and service performance. 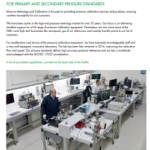 Besides Fluke, we provide calibration services and repair services by our exquisite service department & metrology laboratory for other brands like DHI, Ruska, Hart Scientific and Pressurements.